The Stamped social networking iPhone and iPod Touch app is generating some hefty and well-deserved buzz for its fresh, bright, and exciting perspective for sharing your favorite restaurants, books, music, movies, and iOS apps. By adding the style and finesse of the Path social networking iPhone app to the underwhelming execution of Schemer’s intended purpose, the Stamped iPhone app creates a virtual passport for all of the things that enhance your strapped-to-an-iPhone life. You complete an efficient log-in by authorizing your Facebook or Twitter account. You can also sign-in with your email address. 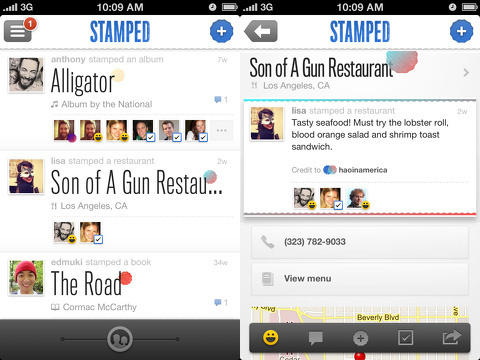 The Stamped iPhone app picks up your existing social profile and photo. You can change your username and select a stamp color that follows you through the interface in the upper right hand corner of your profile picture. You may choose from a selection of lovely, pre-determined colors, or you can mix your own using accurate gesture controls on volume-style bars to customize your color. You can also touch the “randomize” icon for an automatically generated color. You follow curated groups and people known as “tastemakers,” like Ellen DeGeneres, Ryan Seacrest, The New York Times, Nick Swisher, Mario Batalli, Passion Pit, and more. You start with 100 stamps, and you earn more as your friends and members of the Stamped social network engage with your stamps. 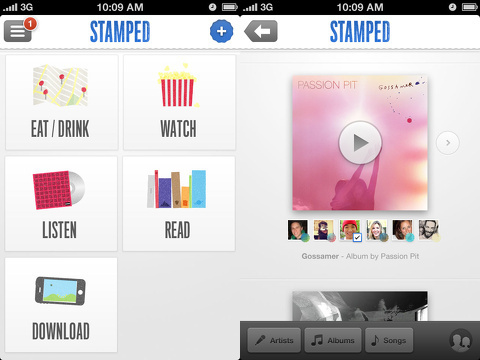 The Stamped iPhone app contains two feeds for exploring the content. The feeds, as well as other straightforward tools like activity history and to-do list, are accessed with a sliding left menu like Facebook’s iOS app. “The Feed” is a list format with the tastemaker’s photo and a simple title, name, or description of the item. There is a line of stamps and brief tally of comments, likes, and engagement. The second feed is known as “The Guide.” The Guide is a quick resource to identify trending content. It is a matrix grid of each category, so you can check out trending apps without scrolling through all of the content. Both of these feeds can be filtered to include more of the tastemakers recommendations, or you can select to filter to you and your friends. There is a volume-style adjustment at the bottom of the screen that responds to your horizontal finger swipes. Each Stamped item is presented with a clean, bright spotlight. If you select a book, you know its title, author, and a brief description. If you want to learn more details, you touch the title to glean details like publisher, publish date, a photo of the cover, and a link to purchase via Amazon. You touch back on the top left corner to go back to the entry to access the sharing features. You touch a happy face to like. You can add a photo or caption, as well as cite the original source for the photo with a couple of quick touches. You can add it to your to-do list by touching the check icon. You can share to Twitter and Facebook, email a stamp, or copy the link to open in a web browser. For each Stamped item, you can access relevant features. For example, you can listen to snippets of a band’s songs, purchase them, and listen to complete songs in Rdio or Spotify. The process of creating a stamp is quick and easy. You touch the plus button at the top of the screen. A sliding menu from the right side of the screen appears with icons to categorize your stamp as a location, book, music, movie, or app. You quickly upload or shoot a photo and add a caption. You can share your stamp with Twitter in a touch. As you add stamps and generate likes, shares, and comments, you will earn more stamps. The Stamped iPhone app effectively combines iOS trends like discovering friends and finds using location services, citing your source to limit liability, and intuitive, one-touch tools and functionality to share and engage. AppSafari review of Stamped was written by Jenni Ward on July 31st, 2012 and categorized under App Store, Books, Food, Free, Music, Social. Page viewed 4878 times, 2 so far today. Need help on using these apps? Please read the Help Page.